Features of Mars Pro II Led Grow Light Hydro lndoor Veg Flowering Lighting. Mars light uses superior 12-band spectrum to achieve maximum photosynthesis response. High yield, large fruit, big flower, all with increased potency and health. The Mars Pro II led grow light replaces HPS/MH/HID while consuming low watts of actual power. Perfect for grow tent or enclosed space growing. Save 70% overall vs HPS. With more yield per watt than HPS light. Chips in reflector cup for better spectrum mix. Produces 2 × higher par than other lights. Extra large aluminum heat sinks and big fans to help cooling. Easily reduce heat by 50%. Safe constant current driver with less than a 0.5% failure rate after long working hours. Features of Mars Pro II Epistar Led Grow Light Lamp Panel Growth Bloom. Mars Pro II Epistar 80. Mars Pro II Epistar 160. Mars Pro II Epistar 120. Mars Pro II Epistar 320. Mars Pro II Epistar 80 and 120. Mars Pro II Epistar 160 and 320. Features of Mars Pro II Cree Leds Grow Lights Bulb Garden Fixture. Mars Pro II Cree LEDs 128 and 256. Mars Pro II Cree LEDs 128. Mars Pro II Cree LEDs 256. Features of Mars Pro II Epistar 80 Led Grow Light For Indoor Plants Seedlings. Mars Pro II Epistar 80 Hydro. 430-440nm, 450-475nm, 620-630nm, 650-670nm, 730nm, white. 2ft × 2ft = 0.6m × 0.6m. 3.5ft × 3.5ft = 1m × 1m. 12'' x 11'' x 5'. 8 lbs / 3.5KG. Features of MarsHydro Pro II Epistar 120 Led Grow Light Bulb Indoor Plants. Mars Pro II Epistar 120 Hydro. 2ft × 3ft = 0.6m × 0.9m. 3.5ft × 5.5ft = 1m × 1.6m. 23'' x 14'' x 6'. 13 lbs / 5.5KG. Features of Mars Pro II Epistar 160 Led Grow Light Hydro Veg Flower Hydroponic. Mars Pro II Epistar 160 Hydro. 2ft × 4ft = 0.6m × 1.2m. 3.5ft × 6.5ft = 1m × 2m. 21'' x 14'' x 4'. Features of Mars Pro II Epistar 320 Led Grow Light System High Par. Mars Pro II Epistar 320 Hydro. 4.5ft × 4.5ft = 1.3m × 1.3m. 6.5ft × 6.5ft = 2m × 2m. 23'' x 23'' x 4'. Features of Mars Pro II Cree LEDs 128 Led Grow Light. Mars Pro II Cree LEDs 128 Hydro. 430-440nm, 450-475nm, 620-630nm, 650-670nm, white. 20'' x 13'' x 5'. Features of Mars Pro II Cree LEDs 256 Led Grow Light Veg Flower. Mars Pro II Cree LEDs 256 Hydro. 22'' x 21'' x 5'. 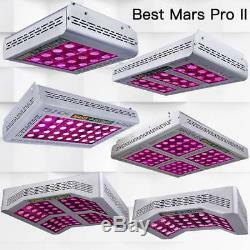 1 x Mars Pro II led grow light as per the model you choose. 1 x Power cord(as per country standard). Customers Feedback on Mars Lights. Energy saving, ETL safety certified, fireproof parts inside, no risk of fire or burning, high efficiency, high par, high lumen. Hydroponics, hydro, soil, aquaponic, greenhouse, horticulture, indoor garden, farm, grow cabinet, home depot, office, exhibition, gardening, breeding. Medical plants, tomatoes, peppers, chills, lettuce, orchids, strawberry, bonsai, flowers, herbs, vegetables, fruits, houseplants, green leaves. Are you Mars Hydro factory? We are Mars Hydro factory as you can see our store name is "marshydro". We sell 100% authentic MarsHydro products with lowest factory price. Beware fake sellers who copy our photos/brand but sell our products at low price. Choose Mars Hydro Light According to Your Needs. Light Match for Grow Tent. 1.5' x 1.5. 27'' x 27''x 63'. 39'' x 39''x 70'. 3.5' x 3.5. 48'' x 24''x 70'. 96'' x 48''x 78'. 96'' x 96''x 78'. The item "Mars Pro II 400W 600W 800W 1200W 1600W LED Grow Lights Full Spectrum Veg Flower" is in sale since Wednesday, May 30, 2018. This item is in the category "Home & Garden\Yard, Garden & Outdoor Living\Gardening Supplies\Hydroponics & Seed Starting\Grow Light Kits". The seller is "marshydro" and is located in Los Angeles, California. This item can be shipped to United States, all countries in Europe, Canada.